A study of university students found that those who brought drinks, especially water, with them as they sat their exams performed up to 10 per cent better than those who did not. Forget expensive private tutors and brain-boosting vitamins. The key to exam success could be as simple as a glass of water.Students who took a drink into the exam hall did up to 10 per cent better than those who did not – the difference between a grade. Should children drink more water? 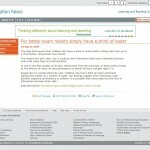 The effects of drinking water on cognition in children. 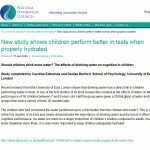 London University Researcher Dr Caroline Edmonds said children who had a drink of water 20 minutes before sitting tests performed significantly better on a variety of tasks. 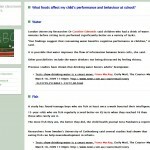 “Our findings suggest that consuming water benefits cognitive performance in children,” she said. It is possible that water improves the flow of information between brain cells, she said. 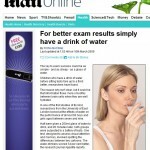 The Daily Mail reports that children who have a drink of water before sitting tests fare up to a third better, researchers have found. The reason why isn’t clear, but it could be that information flows more smoothly between brain cells when they are well hydrated.